This thread is dedicated exclusively for those students currently enrolled in the InterNACHI free online "How to Inspect Swimming Pools Video Course". The goal of this course is to teach students how to inspect residential swimming pools. I'm guessing this photo has been used a few dozen times. I noticed this course seems to hit the electrical aspects quite a bit more than the other course. When I see something like this, it really doesn't strike me as clever. I spent a long time working as a teacher in a Paramedic school, and have enough firsthand experience with kids and pools to know these alarms matter. I think this might make a nice piece to make sure homeowners get a copy of. 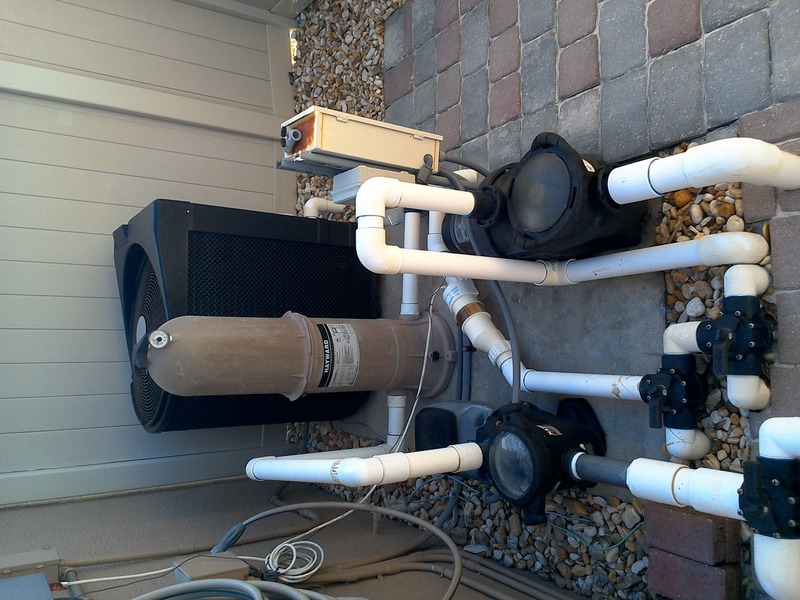 The attached photo shows a typical in-ground pool pump configuration in a central Florida residence. 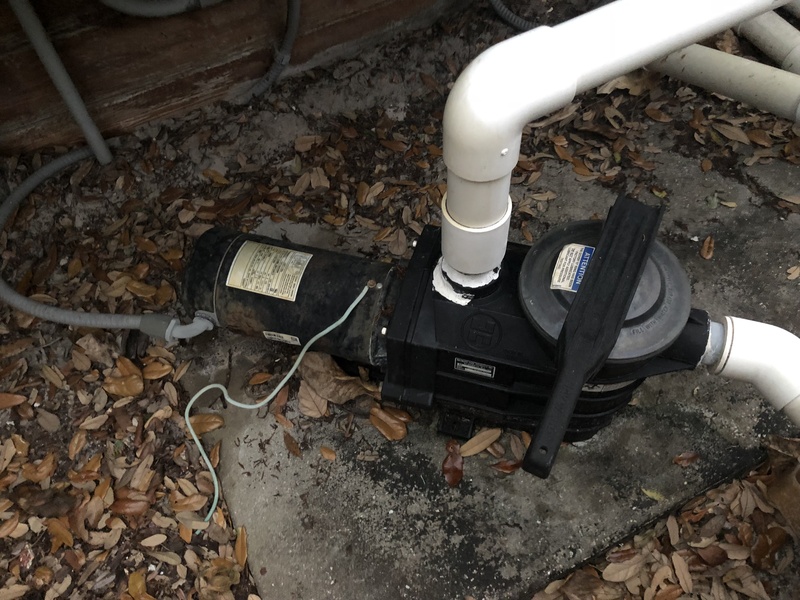 The configuration has a poured concrete slab for attaching the pool pump and is properly bonded to the grounding system. Note the control valves and their location. This makes shutting the flow of water off or making adjustments to the velocity, easy and trouble free. Pool pump stations such as this one should be free of any vegetation and debris, shielded by harmful UV sunlight, and be easily accessible at all times. In recently reading the article on swimming pool barriers I would highly encourage all inspections to make this a must re-read item twice a year for those living and working in the southern half of the United States, and especially those working in Florida. This article covers the regulations for proper swimming pool safety barriers and how they should perform. “Child Proofing Windows and stairs” Child Proofing Windows is very important for child safety. Children are injured or die every year from falling out of them. Case in point, Famous musician Eric Clapton 3 year old son died falling out of a 20 story window ,had they had safety lock on the window where didn’t open no more than 4" he would have not fallen out… So please child proof Windows and stairs. This overall picture of the pool shows the pool and the decking around the pool. There are cracks visible in grout joints of the coping around the pool. The coping must be inspected for any loose tiles. The pool water should be at half depth of the weir door, but the water in this pool appears to be slightly lower than half way which may prevent skimmer from working efficiently. There is no handrails provided for entry/exit of the pool. Pool Skimmer: Pool skimmer is for purpose of removing debris floating at top surface of pool water. The pool skimmer comprises of a weir door, skimmer basket, access cover plate (with a hole). Entire assembly shall be in a water tight shell set in ground with access cover plate flush with pool deck. The pool water level shall be at approx half depth of weir door. The skimmer basket shall be cleaned daily to dispose off collected debris. 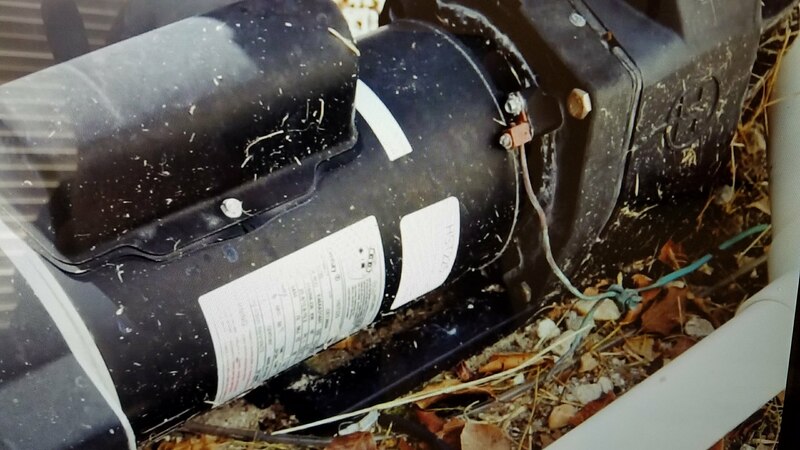 The pool system pump was leaking at the time of the inspection. Evidence of prior attempted repair evident. The pool system pump was also excessively noisy during operation. The inspector recommends that this condition be evaluated and any necessary work be performed by a qualified contractor. The verbiage information in No Visible Evidence Language May be Evidence Against You article is invaluable. The liability language noted in the article is exactly how I would normally word that statement. Going forward I will be extremely careful regarding verbiage and may go so far as to create a template for the final reports issued. When I inspect swimming pools I like to explain to the client the importance of safety and the maintenance of the swimming pool, Cuando inspecciono albercas les explico a los clientes la importancia de la seguridad y elmantenimiento de las albercas. 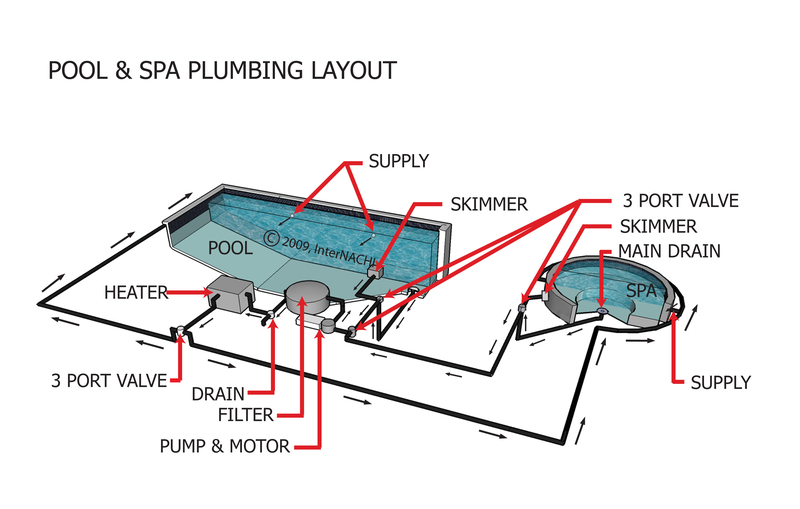 In this graphics show some of the components of the swimming pool, I like to show my clients the components so they understand better how the swimming pool function and the safety procedures they have to follow to protect the children. Bonding is joining metallic parts to form an electrically conductive path that will result in electrical continuity between components to ensure that the electrical potential will be the same throughout. Keeping the electrical potential at the same level reduces the hazard created by stray currents in the pool or in the ground around the pool. Pool light GFCI faulty. This condition was observed at the pool equipment area. Refer to photograph for further clarification. 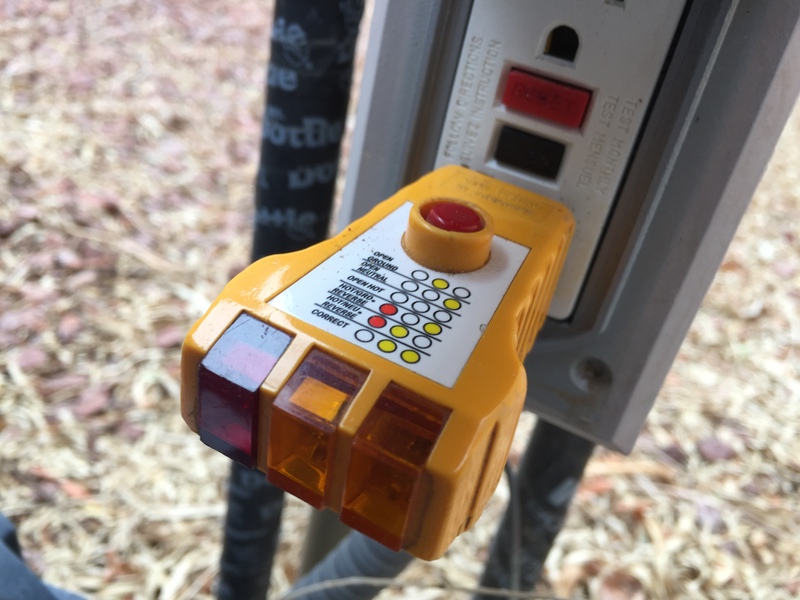 The GFCI outlet had no power and would not reset, This can create a potentially hazardous condition. 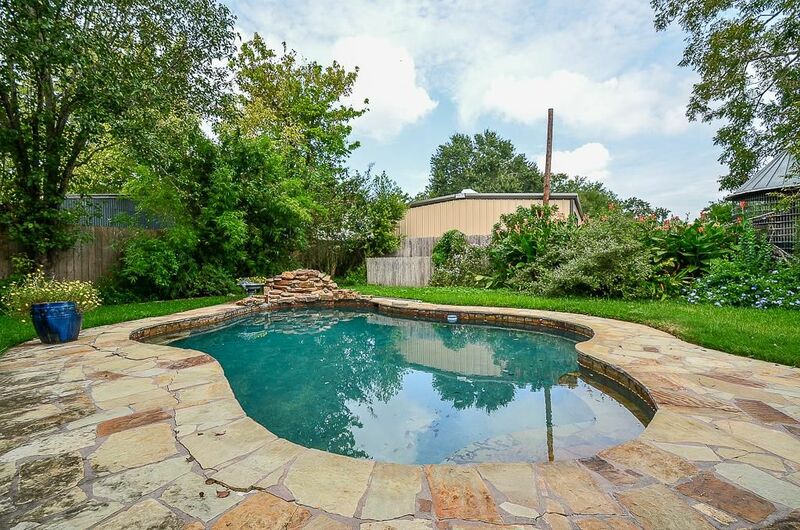 It is recommended that this finding and all associated components be reviewed and corrected as needed by a licensed and qualified Pool Contractor. Carbon monoxide (CO) is a colorless, odorless, poisonous gas that forms from incomplete combustion of fuels, such as natural or liquefied petroleum gas, oil, wood or coal. CO detectors should be placed strategically throughout the home in order to alert occupants of high levels of the gas. Pool drain safety is a concern on all pools. In 2007 a little girl sat on an open drain and was eviscerated. Since then laws have been enacted to circumvent hair, body and limb entrapment. When inspecting a pool the inspector should make sure that the bottom drain is one that meets code requirements. Pool Safety barrier. 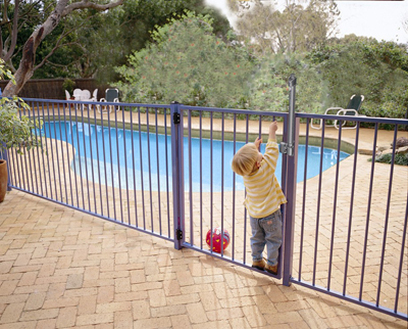 The pool safety barriers are designed to keep small children from drowning in the pool. Whichever barriers are installed they should be inspected each time the pool is used. Making sure that the required barriers in your jurisdiction are installed and properly operating is very important. Pool alarms. There is several different types of pool alarms. They are wave sensing, sub surface, and wristband. The wave sensing detects when a wave connects the contacts with water then completes the circuit sounds alarm. The sub surface detects the water pressure difference caused by induced pressure changes. The wrist band is worn by child and detects when it gets wet. All alarms still require operator to turn on and maintain no alarm is fool proof. 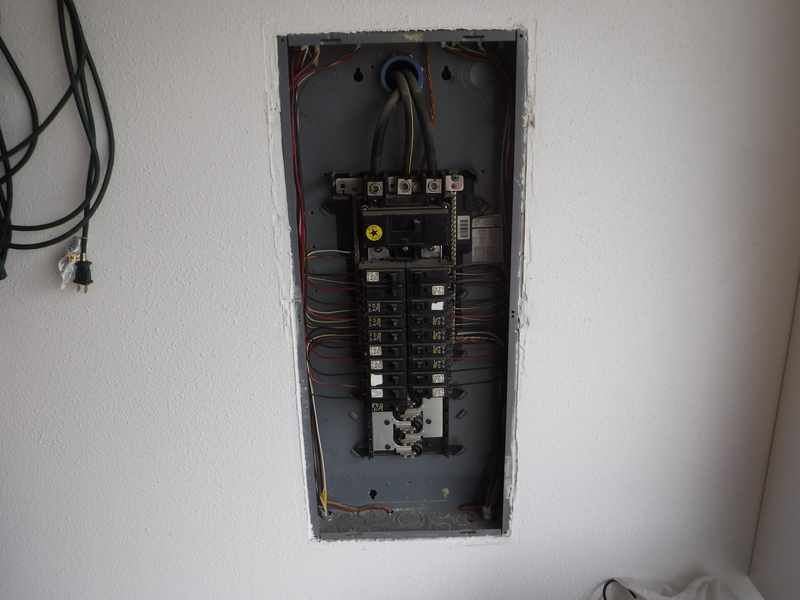 The electric panel is a 200 amp 1 phase 120/240 volt Square D service. 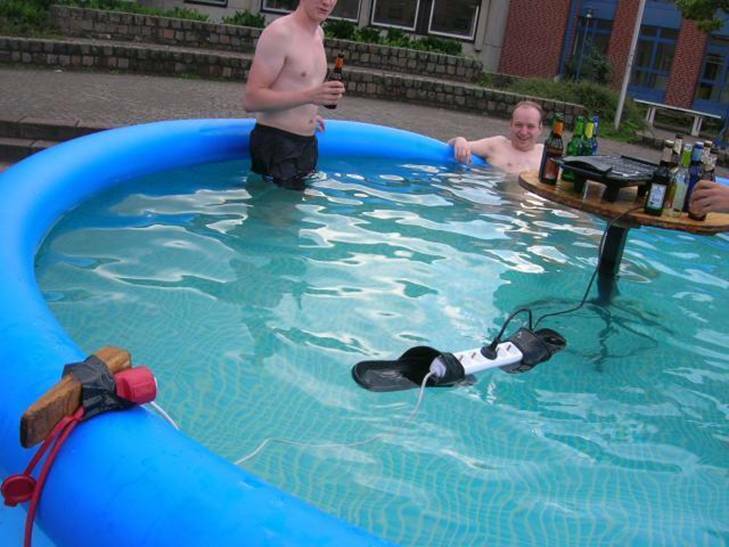 The owner was concerned that the electric panel might not be large enough to handle the electrical needs of the current house and future pool. I suggested that the owner contact a licensed electrical contractor to make the final decision.